WARWICK — Warwick sophomore guard Kristen Desrats high-fived each of her teammates coming off the floor after a timeout with two minutes left. They had just forced a turnover and were tied at 31 apiece against Monroe-Woodbury. The Wildcats milked the clock with several ball-reverses around the perimeter before Desrats drove into the lane. Almost immediately, the defense collapsed and she dropped a perfect bounce-pass to junior forward Caitie Unger. It gave the Wildcats a two point lead with 1:27 left, and momentum they needed to fight off the feisty Crusaders. They outlasted Monroe-Woodbury 37-33 in a non-league win. Along with Desrats, eighth-grader Paige Girardi, Unger and junior Isabella Astorino each had eight points — combining for 32-of-the-team’s-36 total points. Both teams played a suffocating 2-3 zone defense, which resulted in a combined 21 turnovers. 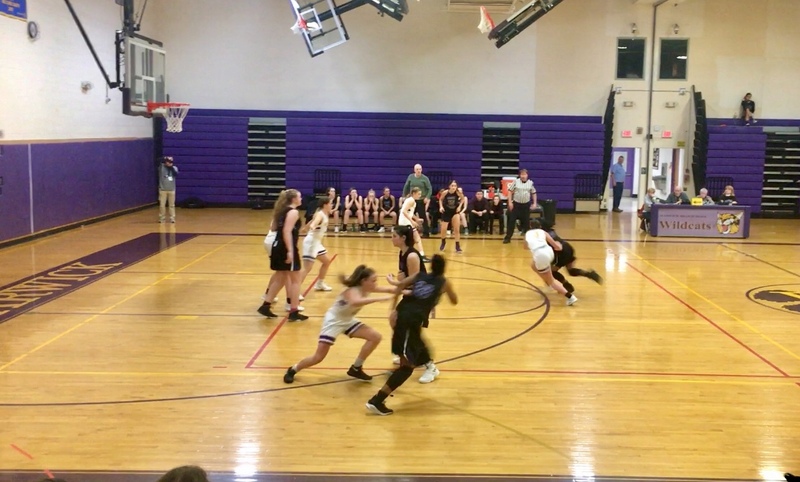 Warwick didn’t do anything out-of-the-ordinary to contain 6-foot forwards Melissa Alifano and Jamie Waldron, but their help-defense and effort made it difficult for them to score. “I knew the girls were gonna give their best effort, but I wasn’t sure if they would be able to deal with Monroe’s size,” said Warwick head coach Jim O’Brien. “We were supposed to give help on the block, and for the most part we did. Our center (Isabella Astorino) fought Jamie (Waldron) tooth-and-nail — about as good as I’ve seen anyone play her in two years,” he added. O’Brien is Waldron’s uncle. He admitted that no matter who wins, there’s never any hard feelings. Waldron was held to five points & six rebounds — both season-lows. She admitted that playing against her uncle is fun, and hopes to play him again this season when the stakes are higher. O’Brien enjoyed the non-league challenge, but is focused on two league games which will determine their playoff seeding.